WHEN Betty Humes started working in Boots you could buy a lipstick for two and six and Bill Haley was rocking round the clock. More than 55 years later, the world has changed but Betty is still on duty at the large chemist chain. The 77-year-old gran from Newton Mearns, East Renfrewshire, is now one of the UK’s longest serving employees. She works as a dispenser in the Boots branch in the Avenue shopping centre. On her day off she will even deliver medicines for housebound customers who are unable to pick up prescriptions from the shop. “I would be lost without my job,” she says. “When I reached 65 I decided to stay on for a while and I never really stopped working. Boots asked me to stay on and I agreed, as long as I was not taking a job from a young person. “It keeps me young and my brain sharp. I could live on my pension but am happy to work. Teenage Betty started working in a Kilmarnock branch of Boots when she left school at 15. She went on to marry her sweetheart Graham, and her son Kenneth, now 51, soon came along. 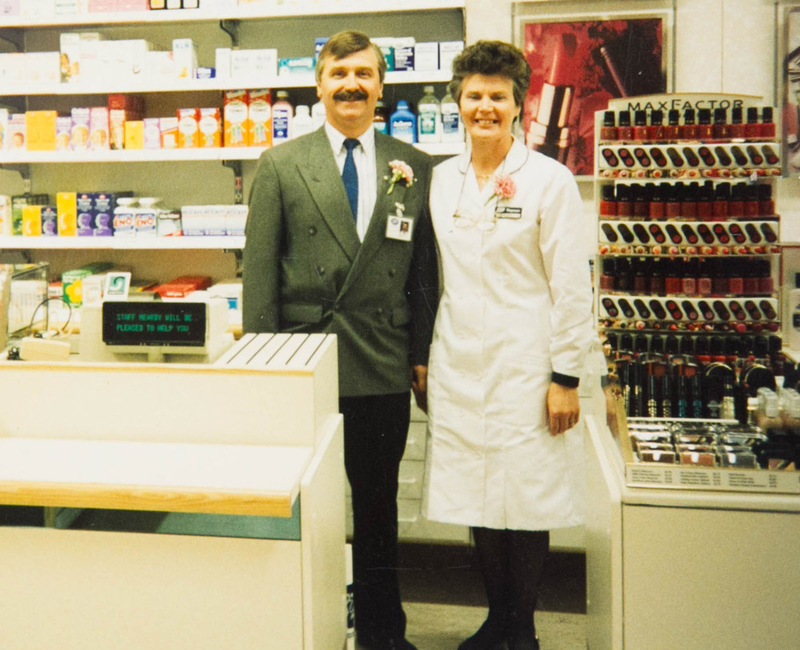 She returned to her job at Boots when Graham started school. “I worked my way up from the shop floor where I sold cosmetics, toiletries and the like,” she says. “Then I was asked to train as a dispenser in the pharmacy. There have certainly been a few changes over the years. “Back then, I used to mix and prepare some ointments and medicines. “But they mostly come ready for use, manufactured by the drug companies. “The collection of chemists’ bottles you used to see in pharmacists have all gone. “Computers have taken over and there’s no struggle to decipher doctors’ handwriting on prescriptions. 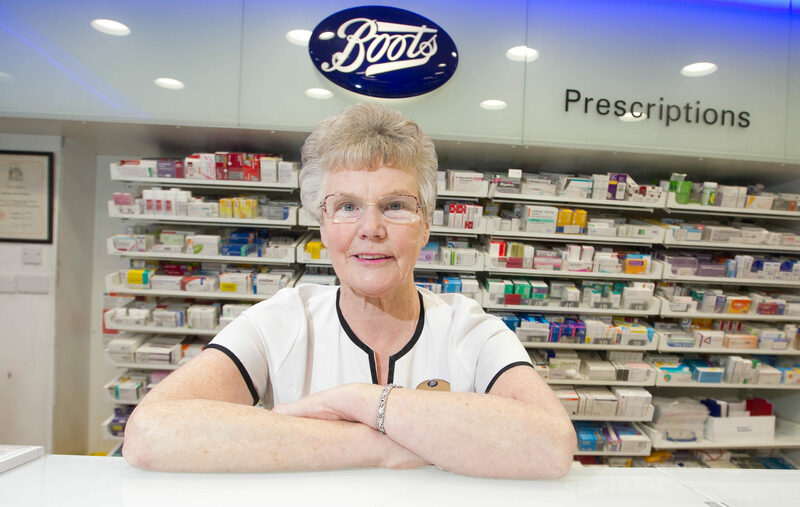 Now as she approaches her 56th year at Boots, she has gone part-time and clocks in once or twice a week. “If they are busy they call me to work extra days,” she says. “I just seem to have been blessed with energy. “The thought of retiring doesn’t appeal to me at all. “I am healthy and don’t need any medication. No heart pills, blood pressure ones, or anything. Betty was diagnosed with throat cancer when she was 50 but, after treatment, returned to work and has not looked back. “I used to sell raffle tickets at the British Legion when many people still smoked. In her spare-time she does her garden and sometimes a neighbour’s. Weekends are spent helping the elderly in her community. Her boss, store manager Russell Cullen, said: “Betty has a huge amount of energy. “I can only hope I have too at her age. “I first met her when I worked Saturdays at the store and she was still there 13 years later when I returned as manager. “On her day off, she will deliver medicines to housebound customers. “I believe she then goes on to make them a cup of tea, something to eat and look after them. Dr Paul Shiels, professor of Geroscience at Glasgow University, said: “Betty has obviously not accumulated as much wear and tear across her body. “Working, exercising, not smoking, keeping slim, eating healthily and having an active social life all contribute to ageing well. “They are all vital to remaining healthy as we grow older.